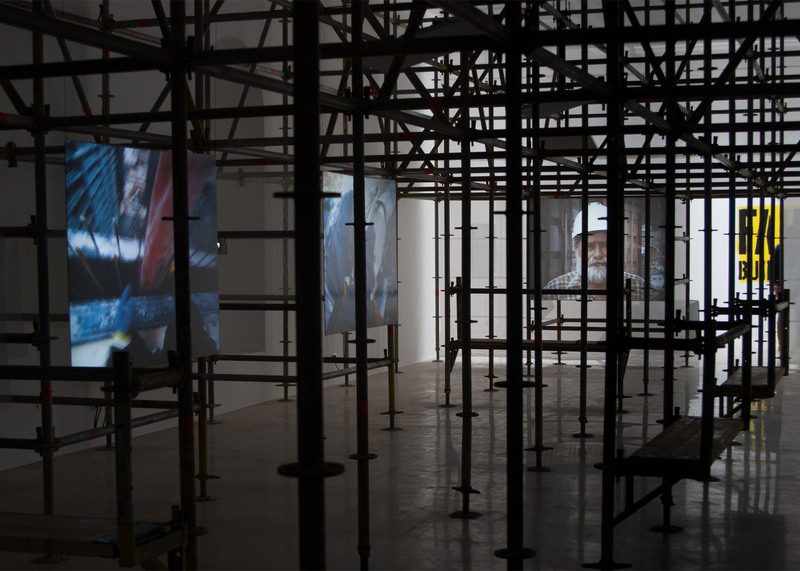 Venice Architecture Biennale 2016: unsettling scenes of building sites are screened amidst a full-scale scaffolding structure inside Poland's Biennale pavilion, which focuses on the plight of the construction worker (+ slideshow). With Poland seen by many countries as a source of cheap construction labour, curator Dominika Janicka and colleagues Martyna Janicka and Michał Gdak sought to highlight the difficult and often dangerous conditions experienced by builders. They claim that the construction worker is the "one of the most underrepresented participants in architecture", with working conditions and respect often overlooked in favour of deadlines and budgets. To show the extent of this, they produced a series of documentaries about different construction sites in Poland. These films show footage of working conditions, many of which induce a sense of vertigo. They show builders putting themselves in potentially life-threatening situations, in the use of heavy machinery and atop high-rise structures. The films also include interviews where builders share their personal experiences, ranging from the length of the working day to training and payment. 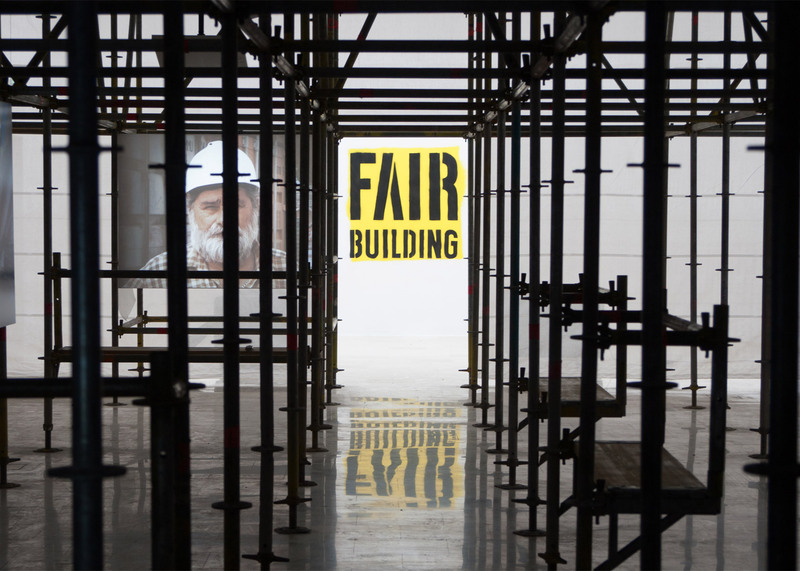 "By presenting the stories of persons directly involved in the building process, we ask whether fair trade is achievable in the field," explained Dominika Janicka, a member of design collective AD12. "If so, what would it be? Is fair building possible?" she continued. "We don't focus on looking for culprits responsible for the abuses occurring at the various stages of the construction process. Rather, we create a space to reflect on how to make this process not only effective but also fair." 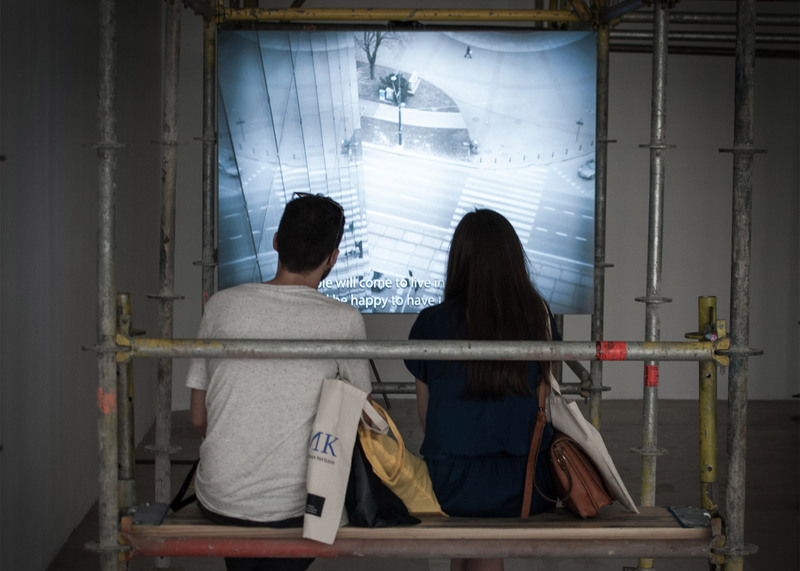 Visitors are invited to watch the films within a large scaffolding structure, which fills the main exhibition room of the 1930s-built Polish Pavilion. Rough wooden boards provide seating, encouraging people to spend more time. In the room beyond, the scene changes to mimic an investor's showroom apartment – aiming to highlight the contrasts between the different sections of the industry. 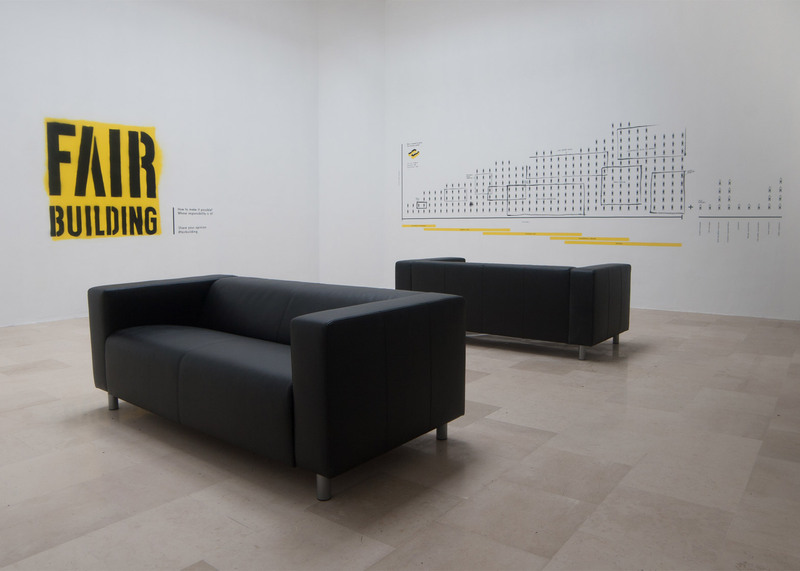 This space features an infographic that extends across an entire wall, showing the breakdown of workers and human cost of an example housing project. Scribbled markings offer extra information about accidents, migrant workers and unpaid overtime. The position of architects towards construction workers has been a hot topic ever since Zaha Hadid said the Qatari government was responsible for the hundreds of migrants who have died working on football stadiums for the FIFA World Cup 2022. 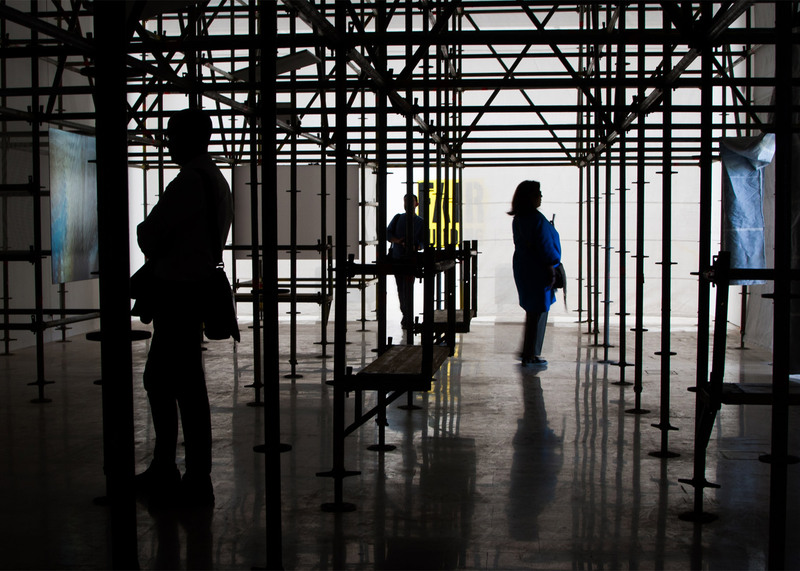 Janicka hopes the Polish Pavilion exhibition will draw greater attention to "a largely ignored sector of the industry" and encourage everyone – from architects to consumers – to demand the same high standards in construction as they do in other industries. 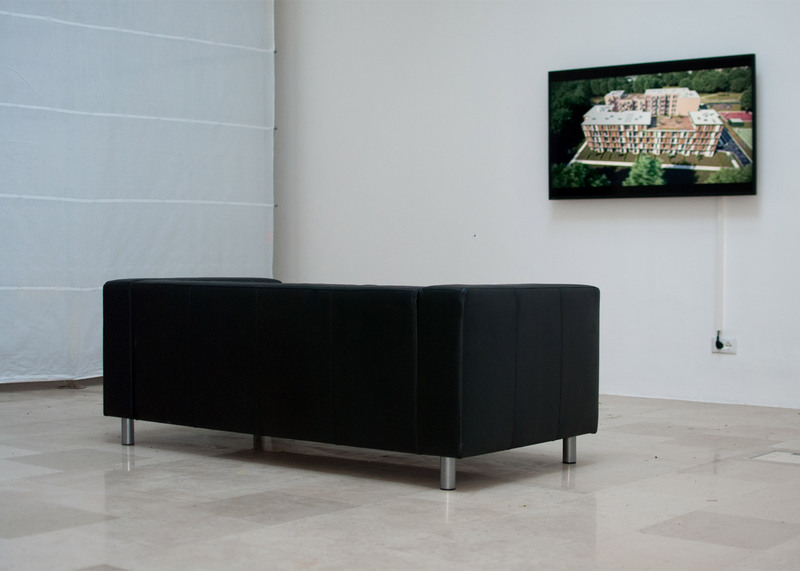 The Polish Pavilion is located in the Giardini, one of the two main venues of the Venice Architecture Biennale, which continues until 27 November 2016. Other highlights here include a cavernous cloud-like structure in the Swiss Pavilion and a swimming pool inside the Australian Pavilion. Photography is by Maciej Jelonek, unless otherwise stated.